Are you ready for the mother of all play dates? Schedule your next moms night out at Studio Movie Grill with A Bad Moms Christmas event for a night of big laughs, munchies and priceless memories with your besties! Chance to with a Trip to Hollywood for A Bad Moms Christmas world premiere too! A Bad Moms Christmas event at SMG is the perfect holiday get-away for you and your girlfriends! Reserve seats for your group of 10 or more, or host a private event, and let’s celebrate the most wonderful time of the year. Request information about the All-inclusive A Bad Moms Christmas group package. 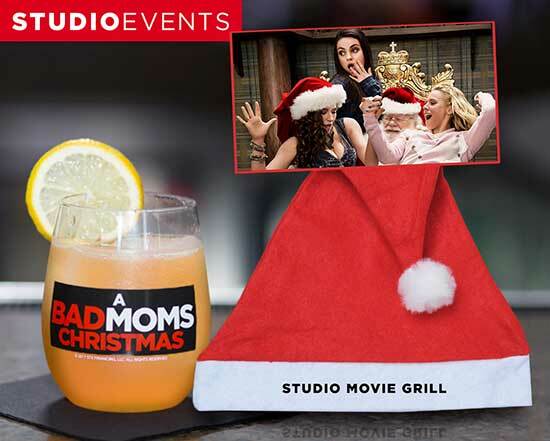 Studio Movie Grill is also giving away a chance to attend the world premiere of A Bad Moms Christmas in Hollywood. Calling all SMG Bad Moms! Have you ever wanted to attend a Hollywood movie premiere? Here is your chance! We are giving away two tickets to A Bad Mom’s Christmas World Premiere. The winner and a guest will receive an all-expenses paid trip to the premiere on October 30 in Los Angeles. It’s your turn to be treated like a star! Winner Announcement: The contest will close on October 15, 2017 at 11:59 pm CST. A winner will be picked on October 17, 2017 no later than 5:00 pm CST and will be announced on our social channels and here at this web address: https://www.studiomoviegrill.com/Story/Bad-Moms-Premiere-Trip. Enter A Bad Moms World Premiere giveaway.